Pharmacies across Alberta are now allowed to distribute take-home naloxone kits as part of the government’s plan to tackle a growing fentanyl crisis, officials announced Wednesday. Pharmacies across Alberta are now allowed to distribute take-home naloxone kits as part of the government's plan to tackle a growing fentanyl crisis, officials announced Wednesday. Naloxone is a drug that can be injected to temporarily reverse an overdose of fentanyl or other opioids, allowing the patient to then get emergency medical help, the province said in a release. "We know naloxone saves lives. Having it available in pharmacies means more Albertans using illicit fentanyl have a chance to have an overdose temporarily reversed and get medical help," Dr. Francois Belanger, Alberta's acting chief medical officer said at an event at the Calgary Midtown Co-op. In 2015, there were 272 overdose deaths involving fentanyl in Alberta, up from 120 in 2014. "Let's be clear, fentanyl is a killer," said Brandy Payne, associate minister of health. "What we can say for certain is that take-home naloxone saves lives." So far 300 pharmacies have signed up to distribute the kits, which will be free of charge but require a prescription. About 1,100 drug stores are eligible to take part in the program. Alberta Health Services is providing the kits at a cost of about $27 each, including supplies and distribution, the province says. 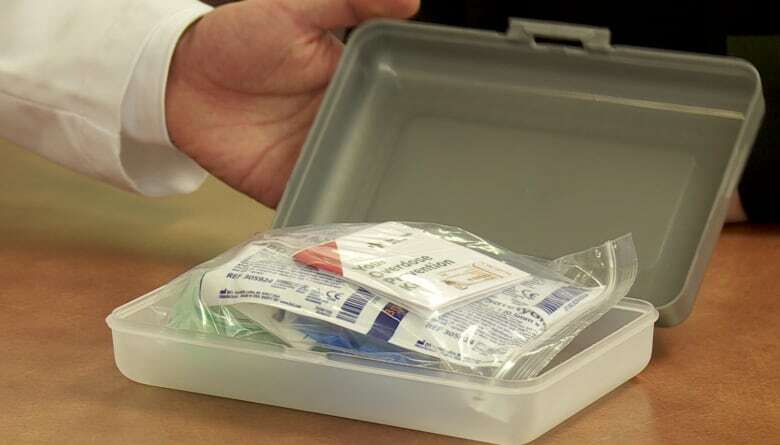 Emergency rooms and some community health centres will also have the kits on hand. EMS crews will have the ability to access the kits as needed, Belanger said. Each kit contains two units of naloxone, two syringes, two alcohol swabs, two latex gloves, a one-way breathing mask and instructions.